Jason Irby and the Wabbaseka Memorial Committee greeted friends and visitors at the 5th anniversary ceremony of the Arkansas Flag/Wabbaseka Memorial Plaza located in the Wabbaseka Community Park on Highway 79 and Myrtle Street in Wabbaseka, Arkansas. A grand flag ceremony was performed by color guards from the Navy Operational Support Center of Little Rock and the ROTC of the University of Arkansas at Pine Bluff (UAPB), Dollarway High School, and Pine Bluff High School. Colors were posted by the Pine Bluff High School ROTC. Bestowed to Dollarway High School. Presented by the Pine Bluff High School ROTC. Bestowed to Jason Irby, memorial founder and chairman of the Wabbaseka Memorial Committee. Presented by the Pine Bluff High School ROTC. Bestowed to Dr. David Ware, Arkansas State capitol historian. Presented by the University of Arkansas at Pine Bluff ROTC. Bestowed to Deb Crow, the Arkansas State Fair director. Presented by the Dollarway High School ROTC. Bestowed to Jason Irby. Presented by the University of Arkansas at Pine Bluff ROTC. Bestowed to O.C. Horton, a retired veteran from Wabbaseka and sailor aboard the USS Arkansas CNG 42. Presented by the Pine Bluff High School ROTC. The 5th anniversary of the Arkansas Flag/Wabbaseka Memorial theme was to recognize several individuals that made significant contributions to the local community, state of Arkansas and the United States. Theodis Riggins, retired veteran from Wabbaseka, was recognized for service to the United States, the state of Arkansas, to his community, and to his devotion during the inaugural ceremony of the Arkansas Flag/Wabbaseka Memorial. David Ware presented a Capitol Citation on behalf of Arkansas Secretary of State Mark Martin to Mr. Riggins. Jeanette Dardenne was recognized with a Certificate of Recognition from the Arkansas Secretary of State for her dedication to the beautification and maintenance of the memorial and adopting the memorial as “her baby”. Jason Irby, founder and establisher of the memorial, was presented with the Pioneer Award by the Wabbaseka Memorial Committee and with a Capitol Citation from the Arkansas Secretary of State Office. “I was so surprised when the Wabbaseka Memorial Committee presented me with the Pioneer Award, and then when David Ware presented the Capitol Citation to me, all I could say was wow,” Irby said. Comments and presentations concerning the flag and veterans memorial were also given by Pastor George Mitchell, Arkansas State Senator Stephanie Flowers, Wabbaseka Mayor Myra Edwards, Wabbaseka Memorial Committee board members O. C. Horton and Marla Jones, International Council of Corvette Clubs (ICCC) President Billy Brooks, ceremony honoree Theodis Riggins, retired veteran Delois Goodloe, and Arkansas National Guard Museum director Dr. Raymond Screws. Earlier this year, it was discussed among the City of Wabbaseka and the Union Pacific Railroad that the property on which the memorial plaza sits is owned by the railroad. This information came as a shock to memorial founder Jason Irby and the Wabbaseka Memorial Committee being that they received permission from the City of Wabbaseka to place the flag and veterans memorial in 2013. The Wabbaseka Memorial Committee was brought into the conversation between the City of Wabbaseka and the Union Pacific Railroad during mid-summer. The railroad offered options to the committee to either rent the property space or remove the memorial. This year’s ceremony was conducted at the Wabbaseka Community Center due to these discussions. Historically during the anniversary ceremony, flags are hoisted up the flag poles in honor of veterans, the Arkansas State flag, and Miss Willie K. Hocker. This year, the flags were presented to patrons by the local ROTC students. Patrons will keep the flags until they can fly over Wabbaseka again. Additionally, Wabbaseka will also install a new mayor in a few weeks as a result of the 2018 elections. “I do not want to put any additional financial burdens on the City of Wabbaseka nor place additional expenses on the members and patrons of our flag and veterans memorial. We are currently reviewing offers and options for potential locations and/or funding resources. This memorial was established as a gesture of goodwill to honor and recognize notable historical accounts related to Miss Willie K. Hocker, the Arkansas Flag, and the USS Arkansas Navy battleship concerning this community and state that have far reaching impacts into our nation,” Irby shared. The memorial was spearheaded by Irby to honor the 100th year anniversary of the Arkansas Flag, USS Arkansas Navy battleship, and to recognize the Arkansas flag designer, Miss Willie K. Hocker of Wabbaseka. The memorial site hosts ceremonies which honors military veterans as well. Individuals, groups, and organizations can make donations here. For more information regarding the Arkansas Flag/Wabbaseka Memorial, please email arkansasflag@gmail.com or visit arkansasflagwabbasekamemorial.wordpress.com. Author Jason Irby and the Wabbaseka Memorial Committee were joined by the Wabbaseka, Arkansas community and guests from around the state to celebrate the 105th anniversary of the Arkansas Flag designed by Miss Willie K. Hocker of Wabbaseka. “It was awesome to have youth from local ROTCs and retired veterans to join us in this milestone event,” Irby said. 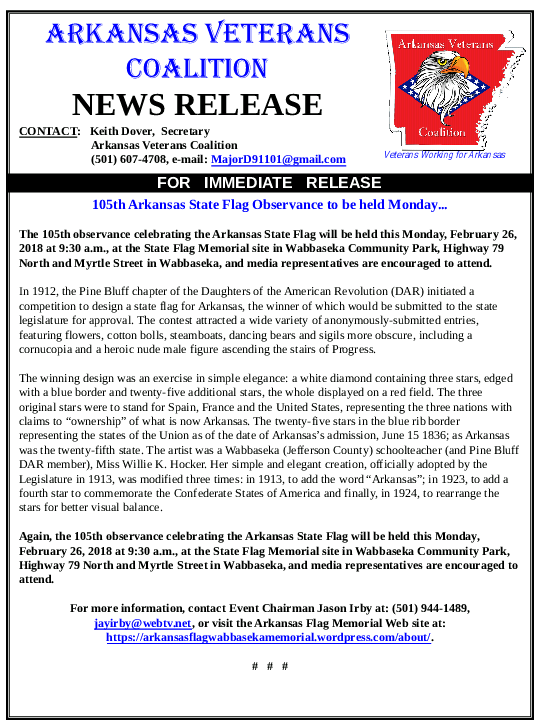 The celebration recognizing the 105th anniversary of the Arkansas State Flag designed by Miss Willie K. Hocker was held February 26, 2018 at Wabbaseka Community Park. “This year’s event was unique because we were privileged to have several veterans from Wabbaseka to stand and be recognized for their service to our country and we even presented a roll call,” said Irby. The next event at the Arkansas Flag/Wabbaseka Memorial Plaza will commemorate the 5th year since its inauguration. 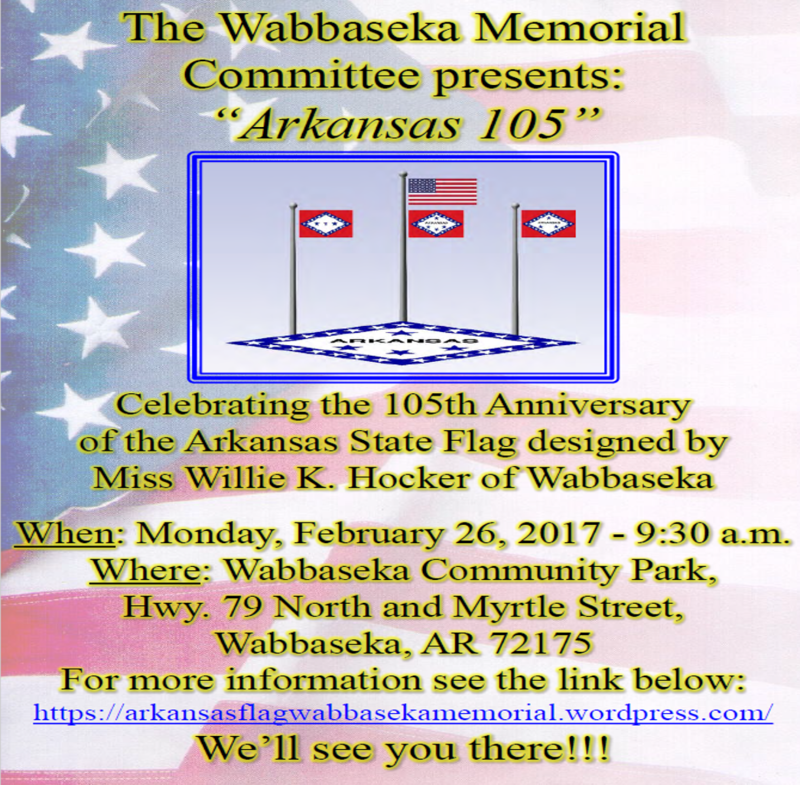 The Wabbaseka Memorial Committee presents “Arkansas 105” a celebration of the 105th Anniversary of the Arkansas State Flag designed by Miss Willie K. Hocker of Wabbaseka, Arkansas. The event will be held on Monday, February 26, 2017 at 9:30 a.m. at the Wabbaseka Community Park located at Highway 79 North and Myrtle Street in Wabbaseka, Arkansas. Join us on October 12, 2016 from 6:00 a.m. to 10:00 a.m. as we celebrate the 3rd anniversary of the Arkansas Flag/Wabbaseka Memorial Plaza. The event will take place at Wabbaseka Community Park, intersection of Highway 79/63 and Myrtle Street, Wabbaseka, Arkansas. The Arkansas State Flag was designed and sewn over a hundred years ago by Miss Willie K. Hocker. Miss Hocker lived, taught, and wrote poetry in Wabbaseka, Arkansas and surrounding communities. A memorial commemorating the Arkansas State Flag, the USS Arkansas Navy battleship, and Miss Hocker was established in the Wabbaseka Community Park in 2013. Recently, it was learned that O.C. Horton, Jr., a Wabbaseka native, served on the USS Arkansas and will now be recognized on the memorial. Jason Irby and the Wabbaseka Memorial Committee would also like to commend our military veterans. Wabbaseka is proud of its contributions to Arkansas’ rich heritage. Jason Irby and the Wabbaseka Memorial Committee celebrate the rich heritage of Arkansas and ask you to help maintain the memorial by making a tax deductible contribution online at http://www.arkansasflagwabbasekamemorial.wordpress.com. We also invite you to come to Wabbaseka, Arkansas and experience the memorial in person. 6:00 a.m. to 10:00 a.m.
We are excited to announce the 3rd anniversary observance for the showcase and dedication of the Arkansas Flag/Wabbaseka Memorial Plaza. 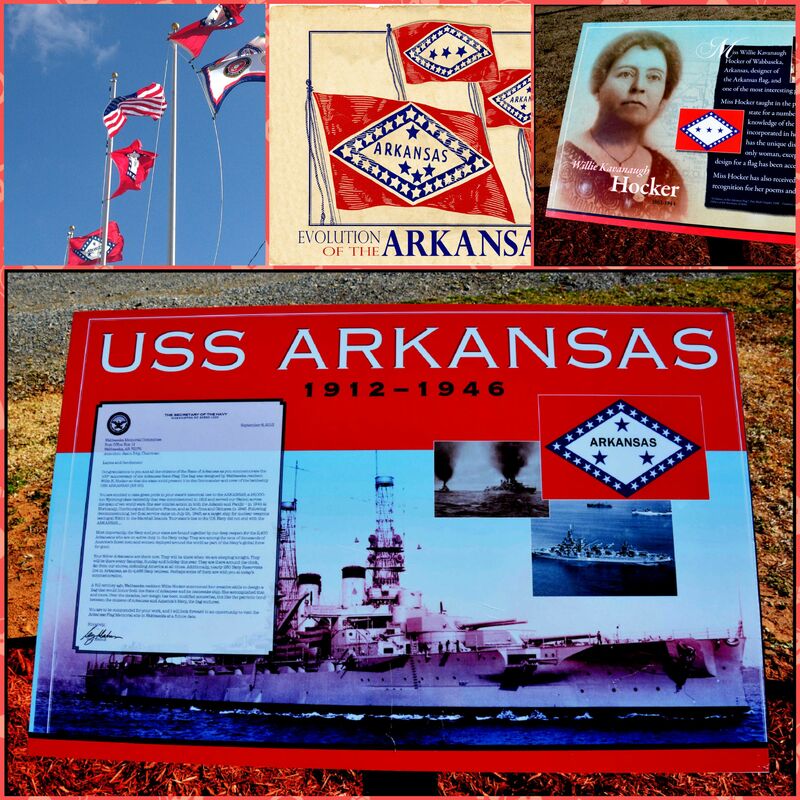 The Arkansas Flag/Wabbaseka Memorial was initially dedicated on October 12, 2013 in honor of the 100th year anniversary of the Arkansas Flag, Miss Willie K. Hocker (flag designer from Wabbaseka, Arkansas), and the USS Arkansas naval battle ship. The Arkansas Flag/Wabbaseka Memorial is now a beautiful flag, veteran’s memorial, and landmark located at Wabbaseka Community Park in Wabbaseka, Arkansas. To celebrate this great occasion and observance, we have invited local radio station KABZ 103.7 The Buzz. The Show with No Name morning show will host from 6:00 a.m. to 10:00 a.m.
On the morning of Wednesday, October 12, 2016 we will feature and join Tommy Smith, David Bazzel, and Roger Scott as part of a live on-site broadcast at the Arkansas Flag/Wabbaseka Memorial Plaza located at the intersection of Highway 79/63 and Myrtle Street in Wabbaseka, Arkansas. The broadcast will also feature local and state governmental officials, local, state and military historians, agricultural and wildlife officials, and citizens from the community. Jason Irby, founder and establisher of the memorial has contributed $500 toward this showcase and fundraiser and is challenging others to meet or exceed his contribution. Proceeds are used for the continued maintenance, upkeep and future improvements of the memorial. 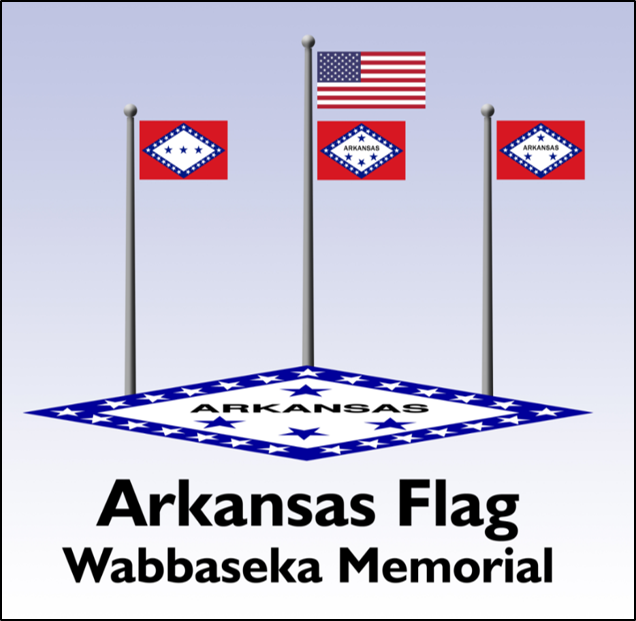 The Arkansas Flag/Wabbaseka Memorial is a non-profit organization managed by the Wabbaseka Memorial Committee. Please join us in our endeavors as we continually seek to honor our veterans and the community. Make your check payable to Wabbaseka Memorial Fund or the Arkansas Flag/Wabbaseka Memorial. You may also donate by visiting JasonIrby.wordpress.com/wabbaseka-memorial. Author Jason Irby and the Wabbaseka Memorial Committee showcased documents, panels, and other artifacts pertaining to the Arkansas Flag/Wabbaseka Memorial. The memorial was founded by Irby in 2013. The End of Year Exhibit was created to commemorate the effort in celebration of the Arkansas State Flag 100th year anniversary. Willie K. Hocker, designer of the Arkansas State Flag, and the USS Arkansas were also honored. The exhibit featured the 2014 accomplishments of the Wabbaseka Memorial Committee and other projects that Irby participated in throughout the year.